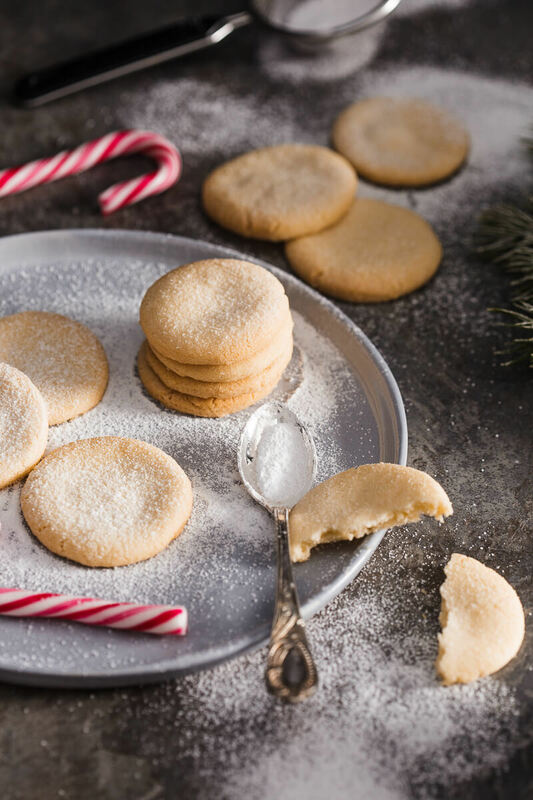 Try these amazing Egg-Free Almond Sugar Cookies! Just a couple of ingredients, but tons of flavour. Perfect for Christmas! Set the oven to 160°C / 320°F. Put ground almonds, flour, powdered sugar and a pinch of salt in a large bowl. Mix the ingredients and add vanilla essence. Cut room-temperature butter into small chunks and add to the flour mix. Use your hands to incorporate the butter into the flour and knead until you get a smooth and shiny dough. Dust your countertop or board with flour and roll out the dough about 2 cm thick. Cut out cookie shapes to your liking. I used a small shot glass for smallish round cookies. Line your baking tray with baking paper and place cookies on top. Make sure you leave gaps between cookies of about 2 cm. Bake cookies for about 10 minutes, until they turn golden brown. Remove from oven and set on a cooling rack to cool. Before serving you can dust with powder sugar for decoration.